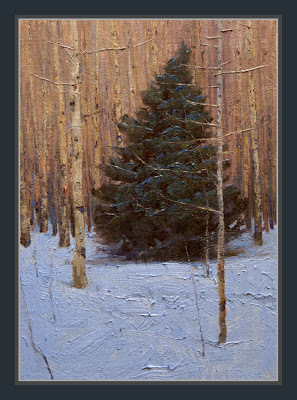 SOLD - Spruce and Birch - This painting is available at the Albuquerque Museum's Miniatures and More show that hangs through December sixth. If you can visit the show it will be well worth your time, they always have good work. Hi Dan - I have just relaised that the last two posts were PAINTINGS. I guessed they were photos. They are very special and very skillful, especially because of the tight range of colours in the background trees.